Members loyal to the Islamic State in Iraq and the Levant (ISIL) wave ISIL flags as they drive around Raqqa, June 29, 2014. U.S. President Barack Obama has authorized sending 200 more troops to Iraq to bolster security at the U.S. Embassy and Baghdad's international airport. Obama on Monday informed Congress of his decision in a letter. He said the newest deployment also will include helicopters and unmanned drones. Pentagon spokesman Rear Admiral John Kirby said the troops already have arrived in Iraq. They will join the 275 troops sent to protect the embassy earlier this month. These forces are separate from the up to 300 military advisers the president authorized to assist Iraq as it battles an invading army of jihadists that has taken over major cities and threatens the capital in Baghdad. The latest announcement will bring to nearly 800 the number of U.S. forces in Iraq. Iraqi warplanes carried out airstrikes overnight on the northern city of Tikrit as they battle to regain control from Sunni militants who have declared the formation of an Islamic state across areas of Iraq and Syria. Fighting continued Monday in Tikrit, one of several cities where militants from the Islamic State of Iraq and the Levant (ISIL) took control in a surge beginning in early June. 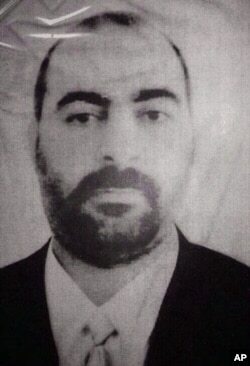 FILE - The official website of Iraq's Interior Ministry claims to show Abu Bakr al-Baghdadi, the head of the so called Islamic State of Iraq and the Levant. On Sunday, ISIL declared in an audio statement posted online that its chief, Abu Bakr al-Baghdadi, is the leader of a new caliphate - a historical term to denote a sovereign state for the Muslim faithful. The term was last widely recognized to describe the government of the Ottoman Empire, which fell after World War I. The group said its flag flies from Aleppo in northern Syria to Diyala province in eastern Iraq. ISIL was once al-Qaida's affiliate in Iraq, but the terror group's leaders disowned ISIL earlier this year for its desire to carve out a caliphate and refusing to obey orders. Al-Qaida's official affiliate in Syria joined in January with Islamist and mainstream Syrian rebels to drive ISIL fighters from the key northern city of Aleppo and several border towns. Military officials say the main ground operation near Tikrit started Saturday with heavy fighting between ISIL rebels and Iraqi special forces, as Iraqi gunships and armor attacked from the south. Former U.S. Ambassador Richard Murphy tells VOA that the declaration of a caliphate by ISIL was a "bold move, typical of the flamboyance it has shown on both the public relations and military sides in recent weeks." But, he points out, "the risk is that it will expose the fissures in its support which has propelled it on the battle field. He argues that the "there is no way that the former Ba'athists [who are fighting alongside ISIL] will welcome back the caliphate," and that "this move may activate many Iraqis and Syrians... who still have pride in their state.....to [turn] against [ISIL]... or to shrink its support." Geopolitical analyst Riad Kahwaji, who heads the Institute for Near East and Gulf Military Analysis, tells VOA a self-proclaimed state will have little of the trappings of sovereignty if none of its neighbors or world powers recognize it. "A non-state actor cannot declare itself a state. There must be recognition by the United Nations, by the international community [of] these borders in order for the state to survive as a state and be treated accordingly. Unless there is a conference called by the superpowers to talk about redrawing borders, we cannot expect to see the birth of a new entity,” says Kahwaji. Kahwaji adds that the current border arrangement, often referred to as the Sykes-Picot agreement, was drawn up during WWI by the superpowers of the day, France and Britain. He also stresses that the important energy resources of the region and the various oil and gas pipelines that connect autonomous areas and states will play an important role in any change in borders. Also Monday, footage released by Iraqi state TV claimed to show Iraqi forces back in control of a border crossing with Jordan, a week after it was seized by Sunni militants, the Associated Press reported. The footage showed security forces on Sunday holding guns in the air and waving flags in front of a sign purporting to be the Turaibil crossing with Jordan. The footage also claimed to show forces on patrol as trucks drove through the crossing. Sunni militants originally captured the border crossing on 22 June, as they pressed on with their offensive in one of Iraq's most restive regions. Officials said the militants managed to capture the crossing after government forces there pulled out. The United States sent 300 military personnel to Iraq earlier this month to strengthen government security forces and help establish joint operation centers to combat the far-reaching Sunni offensive. U.S. advisers are also flying armed drones in Iraqi airspace to protect the U.S. contingent. Separately Sunday, as militants push to alter the region's geopolitical boundaries, Israeli Prime Minister Benjamin Netanyahu called for Iraqi Kurdish statehood. Netanyahu made the comments during a speech to a Tel Aviv think tank. Iraqi Kurds have long-voiced aspirations for independence, while conceding that the goal is not realistic in the region's current state of upheaval. Neighboring Turkey, with its own large minority Kurd population, and Western governments remain opposed the breakup of Iraq. More than 1,000 families have taken refuge in a camp for internally displaced persons in Diyala province in Iraq after feeling fighting between Sunni militants and Iraqi forces near the city of Baqouba. "I took my children and fled," said Limya Hussein in the camp in Khanaqin, a town 140 kilometers northeast of Baghdad. "I couldn't stay there because I am afraid to be killed," she added. The flow of displaced persons began weeks ago and has showed no signs of stopping. Edward Yeranian contributed to this report from Cairo. Some information provided by Reuters, AFP and AP. With ISIL ‘Caliphate’ Declared, What’s Next?